From Rolling Hills, CA, Scott continued to roll throughout his distinguished 4-year career at D-III Occidental College. Scott accumulated some eye-popping numbers: he broke a school record in Passing Yards per game (339.8), Total Offense (9,475), Career Passing Yards (9, 073), Single Season Passing Yards (3,058), Completions in a game (40), Completions in Single Season (253), Career Completions (763), Single Game Passing Yards (476), and Single Game Passing Touchdowns (6), and broke the SCIAC Conference Record in Career Passing Yards, Completions, and Total Offense. 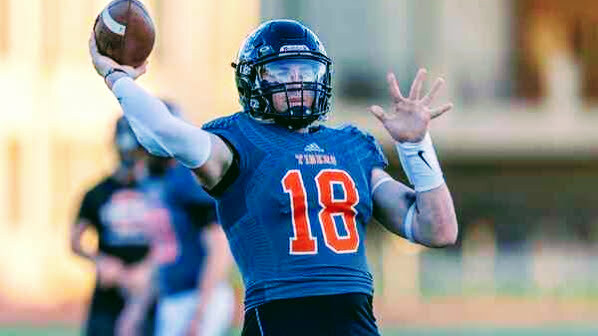 Known as the Aaron Rodgers of Division III, Scott also won SCIAC Player of the Year in 2016, as well as Team Captain/MVP, and 1st Team All-Conference QB. Despite playing against lesser collegiate competition, Scott proved he can more than hang with the big boys during the 2017 USC Pro Day. He completed 62 of 64 passes (1 drop), and finished the workout by connecting with JuJu Smith-Schuster (2017 2nd round pick, Steelers) on a deep post, earning praise from all in attendance. Scott’s impressive performance earned him an invitation to the Los Angeles Rams Rookie Camp, which gave him the confidence he can thrive at the highest level. Scott will join The Spring League in 2018 looking to follow in legendary Jack Kemp’s foot steps as an Oxy Tiger starring in the NFL.